We work directly with the homeless and those in temporary accommodation in Camden. Volunteers can assist with this work in many ways. There are opportunities to do outreach and office work and a variety of one off placements as a community volunteer. We will ensure you are inducted, trained and supported. placements suitable for people who want to train to become outreach workers or work in similar areas such as substance misuse or mental health work. suitable for people who want to support the team in more of an administrative capacity. This is an opportunity for people to use their office skills to help the homeless and other vulnerable people and also gain further experience and training in a busy office environment. This type of voluntary work is suitable for people who wish to offer their skills and experience to help homeless and vulnerable people but do not want to train to be outreach or office workers. This may be through regular work or by offering to organize or support a one off event. 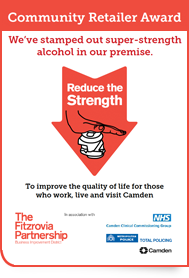 Diversity in volunteering ensures that Camden RTS represents the clients it works with. The recruitment of all volunteers will operate within the principles of CGL’s Equal Opportunities Policy. CGL will provide relevant insurance cover for all volunteers. Volunteers are covered by CGL’s Public Employers Combined Liability Insurance. CGL has developed considerable expertise in supporting and training its voluntary workforce. Volunteers have access to internal staff training as well as specialist training relating specifically to the respective client group we work with at Camden RTS. CGL recognises the need for ongoing support and supervision. Provision will be made for regular, individual supervision. CGL will pay all reasonable expenses incurred when working with projects including travel and mileage allowance. The nature of the work undertaken by Camden RTS allows volunteers access to privileged and/or sensitive information about our clients and/or other agencies. Volunteers must sign a confidentiality agreement to ensure that they understand that information about all clients is confidential and must not be shared with anyone outside the Camden RTS and its partner agencies. Prospective volunteers will be asked to complete a form of consent for CGL to request a check by the Police into any previous convictions/cautions. (This post is exempt from the Rehabilitation of Offenders Act 1974) The existence of convictions/cautions would not necessarily preclude voluntary work for CGL. They have the required skills, commitment and ability to work with the role. Volunteers are required to be 18 years or over.